As the holiday season approaches, why not plan a winter walk to Imber village, which is only open to the public on a few days each year? We had finalised our plans the night before, sat in front of a blazing fireplace. Up early next day, quick cup of tea, then boots on and straight up on to Salisbury Plain, a ten-mile stomp and back home mid-morning for breakfast. This schedule would allow us to enjoy Wiltshire’s vast chalk plateau in near solitude, before the hordes of walkers, cyclists and rangers arrived. Hopefully we would see plenty of the wildlife that abounds on the lush, undisturbed grasslands and copses. Standing outside at 6am on a freezing January morning, the flaws in our plan became apparent. My caffeine requirement correlates sharply with how early I rise, and the one cup of tea so far (cup, mind, not mug, and a smallish one at that) had barely raised a flicker on my internal motor. Danny, my walking companion for the day and someone I have long suspected to be of a much sturdier ilk, was thriving in the early morning darkness. Dermot the dog has unbounded energy at any hour, especially when there are rabbits about. But our efforts paid off. 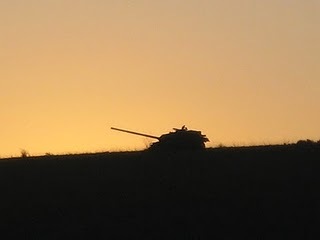 Salisbury Plain is always a rewarding place for a walk, but it particularly inspiring at this early hour. The near-full moon shone brightly, illuminating the footpath, and the overhanging grasses tinkled as we crashed through their frost-covered seed heads. Soon we reached a barred gate that marks the perimeter of the army land. This is usually the point to turn left or right and head home via the outskirts of the plateau. But today, like a handful of other days each year, it marks the boundary of something a bit special. 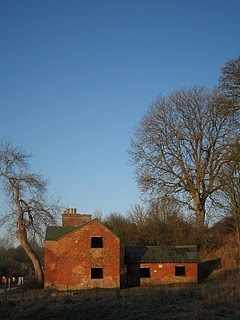 Our target was Imber, a deserted village right in the centre of Ministry of Defence land. They open it to the public for just a few days each year and this sense of something ‘forbidden’ makes it a popular trip. As we had hoped, there was not another soul about. The ghostly outlines of discarded tanks on the hills around provided a reminder of the current land use, but as the first red-brick building appeared, we were reminded that this lonely outpost was once a thriving farming community. The building was the pub, the focus of village life until 1943. In November that year, the MOD told residents they would have to leave so that visiting American troops could practice street fighting. The villagers made this wartime sacrifice with no complaint, perhaps due to a promise that they could return post-war. But to this day, the village is devoid of residents and still used for army training. The only building still functioning is the church of St Giles, which holds services on ‘open’ days. As we left the village, the preparations for a cycle race across the Plain were starting up, with the marshals putting out markers and generally making a lot of noise. We quickened our pace to keep ahead of them and avoid being coated in flying mud. A young deer family trotted briskly across the path in front of us; we stopped to watch them, only to have this scene of countryside idyll torn away by an expletive-laden instruction to, er, ‘go away’. Someone high up on the hillside had spotted the deer before us, and our disturbing presence had prevented a clean shot. Briefly, we considered exerting our right to be there; but he had one gun more than us. Argument settled. Comforted that we had, at least, spared the lives of the those gentle animals for another day, we hurried back to Edington for our sausages and bacon. Buses run to Edington, a village on the northern side of Salisbury Plain. You can also reach Imber from Warminster, which has a train station. 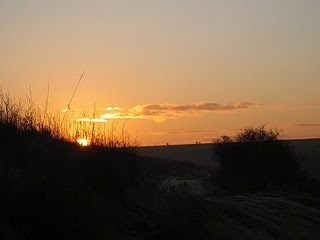 The outer parts of Salisbury Plain are accessible year-round, but Imber only on certain days around Christmas and New Year, Easter and the summer Bank Holidays. Check this website for more information about open days over the Christmas period.